Atomic Absorption Spectrophotometer AAS-4000 is a superior instrument for the research laboratory, and is an advanced and affordable system with high sensitivity that generates accurate and reproducible measurements. The AAS-4000 spectrophotometer is accurate, reliable, and is an exceptional value. 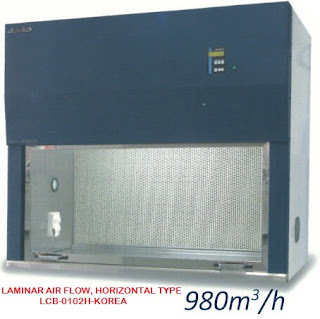 With its built-in, computer-controlled Air/Acetylene flame, titanium alloy burner and high-efficiency glass nebulizer design, the system provides optimal and reproducible results for micro and macro samples with high resolution. Atomic Absorption Spectrophotometer AAS-4000 has a powerful built-in software which permits this instrument to be linked to a computer and a printer to display the photometric and spectral data on the PC monitor. 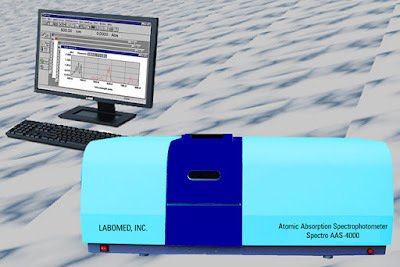 Atomic Absorption Spectrophotometer AAS-4000’s enhanced transmission and full reflection makes this atomic absorption spectrophotometer highly effective and reduces noise. One of its advantages is its accurate wavelength, ease of operation, versatile software applications, and effortless optional accessory installation. 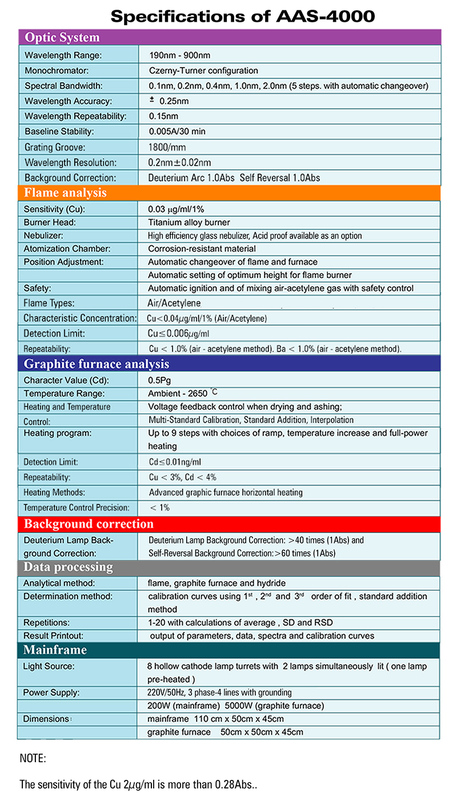 This instrument provides for automatic switching between the flame and graphite furnace, and is widely used for analyzing samples for Agricultural, Food, Geological, Clinical, Metal, Petrochemical, Environmental, Mining and Pharmaceutical applications. It is easy to manipulate, and is fully automated, allowing for automatic adjustment of the lamp current and position, the burner head position, the negative voltage, and the gas flow. Safety is our primary concern, and the Atomic Absorption Spectrophotometer AAS-4000 allows for constant monitoring of the burner head, the flame, the ignition, air pressure, and drain status, to ensure the optimum functioning of the instrument. Atomic Absorption Spectrophotometer AAS-4000 has a highly effective nebulizer, the sensitivity of the Cu 2µg/ml is more than 0.28Abs. The instrument has a motorized 8 hollow cathode lamp turret which allows the automatic positioning and optimization of each hollow cathode lamp by the software. 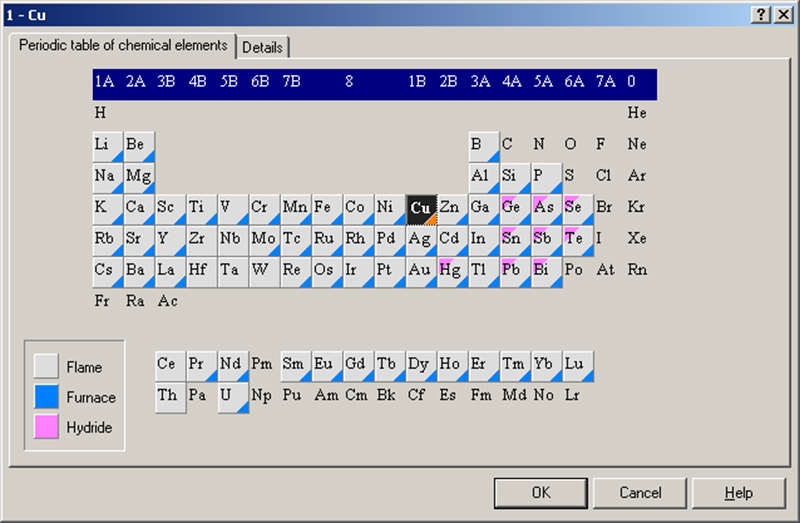 The control of the gas flows for the fuel gas (C2H2) of the burner is also carried out directly from the software, thus allowing optimization of the instrument for the best analytical parameters for a selected analysis. Two methods of background correction are available. The first utilizes a Deuterium Arc lamp and the second is the proven method of Self Reversal. The pressure of the support gas (oxidant) is monitored constantly. If the pressure changes, then the flow of the fuel gas will be stopped and the flame will be safely extinguished. A sensor monitors the level of liquid in the drain and will prevent ignition if too slow. The flame will also be extinguished if the level of liquid in the drain changes significantly. Great post, I like this post. I got lot of information from this post. For some more information please visit our site once Arc Flash Warning Labels . Nice post, Its very useful to us, and we provide some more information about Arc Flash Warning Labels.Please visit our site Arc Flash Warning Labels.